This is a true foundation female for any herd! 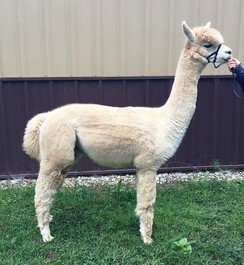 Following Up is the full sister to Futurity Fawn Reserve Champion, MFI Peruvian Formula 1! She has an amazing phenotype, which I highly regard, and an incredible fleece at almost 6 years old. Following Up has an absolutely amazing fawn female at her side sired by MFI Peruvian Candy Man. Her cria is extremely bright, fine, crimpy, and expressing amazing density at 6 months old. This Candyman son is exhibiting the strong fleece characteristics of his sire: long staple length, extreme brightness, high amplitude, high frequency crimp with excellent density. Follow My Lead is following is his Sire's footsteps for sure! His first couple of cria have hit the ground late this summer and look to be very nice! Pick up the excellent male to cost of a breeding.